Following the events of the VAMCT conference (the good (our presentation and our new friends), the bad (a severe organizational snafu), and the ugly (repeat previous), Vid and myself found ourselves with changed plans to head back to Florence sooner rather than later to resume the Florence field season (see subsequent blog entries ;) ). As there were no viable return flights to Florence available immediately Saturday night, the decision needed to be made to alter our return flight to either an expensive variant the following day (Sunday), or to a cheaper option (Monday)–(which plus the price of accommodation evened out to the same cost). Given that our desire was to obtain data on Athenian cultural heritage sites, and that one of the reasons the split was made was that it seemed like the official Greece field season was not going to be as productive in the directions we had anticipated for relevant high profile data collection- we chose to stay in Athens for a day and a half prior to returning to Florence. This decision was, in part, also influenced by the sheer serendipity of timing. Sunday, September 29th is European Cultural Heritage Day, where the majority of archaeological sites and museums around Europe are free for the day. 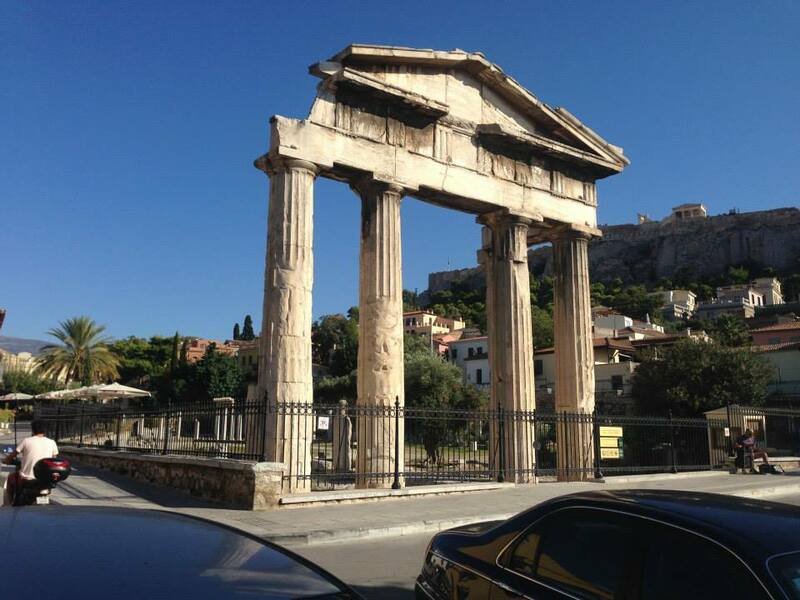 The Roman Forum of Athens framing the famed Acropolis. Over the course of Sunday, September 29th and the morning of Monday, September 30th we surveyed the following sites, capturing photogrammetry suitable for modeling from the National Museum of Athens, the Acropolis, the Acropolis Museum, the Roman Agora, and the Classical Athenian Agora, utilizing a mixed technologies approach of both high quality professional DSLR cameras as well as the cheap digital cameras, iphone camera, and android phone camera we had in our possession. In sum total this represents 80+ GB of data, representing 8,000+ images. A break-down of the sites and descriptions of a sampling of the highest profile pieces collected is provided below. One of the most intriguing facets of the recent boom in digital replication is the concept of copyright and ownership. Who has permission to access a digital past? Who has permission to collect these digital replicas given the ease with which it can be acquired if one knows what how to collect it and can do so without officially violating any rules or regulations of the museum or archaeological site? In the current shifting paradigm towards a democratized past–concepts of permission, ownership, and access need to be challenged and shifted in policy and theory as explicitly as they are changing in actual practice. We would like to use the opportunity we took to digitize sites and artifacts in Athens without official permissions as a case study in future planned papers on the digital policies associated with much of the work we are doing in creating intangible variants of once-tangible and ‘owned’ objects and spaces. Our first target for this will be putting in a paper towards the 2014 International Symposium on Ethics in Engineering, Science, and Technology May23-24 in Chicago. 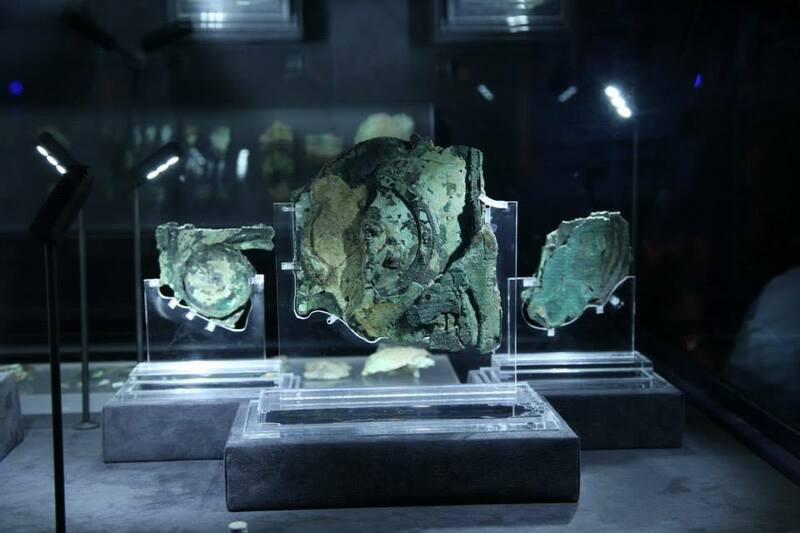 The Antikythera Mechanism on display at the National Archaeology Museum of Athens. The collected image sets will put our various SfM reconstruction techniques (both open-source and commercial) to the test, and will provide us with valuable data on the relative effectiveness of the different shooting approaches we experimented with. Any reconstructed models will obviously be quite a showpiece towards both the technical side of data capture, processing, inspection and visualization on Vid’s end of research, and towards the dissemination of cultural heritage and archaeology on Ashley’s research agenda. 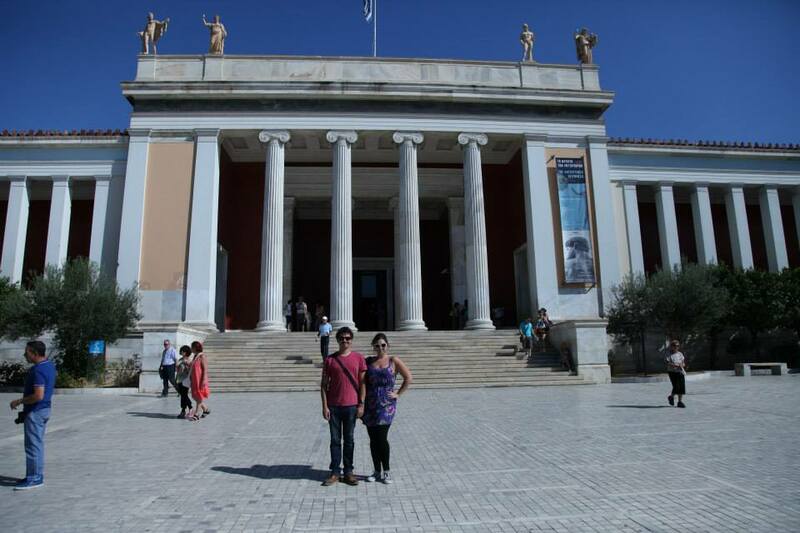 Vid Petrovic and Ashley M. Richter outside the National Archaeology Museum in Athens. Please note all museum and site rules were observed at all times regarding the use of digital photography. 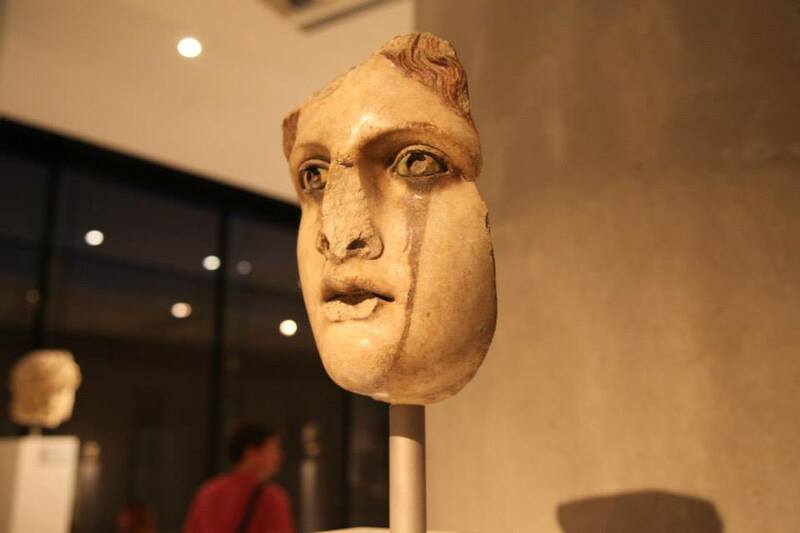 The crying maiden at the new Acropolis Museum of Athens. 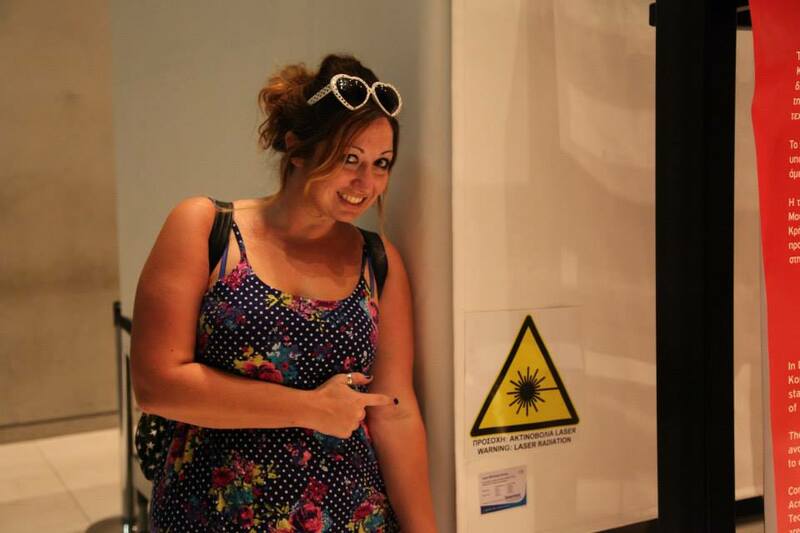 Ashley M. Richter getting over-excited about the on-going laser cleaning of the koure maidens at the Acropolis Museum of Athens. And much MUCH MUCH more from all of the above…. The Delphic Dancers at the Delphi Archaeology Museum. If everyone particularly loves this particular breed of case study–Vid and I propose possibly repeating/expanding the experiment throughout Florence (as was our initial intent)and Rome, specifically with respect to the Vatican area museums and sites–if not beyond. Tagged archaeology, Architecture, art, Ashley M. Richter, Center of Interdisciplinary Science for Art Architecture and Archaeology, CISA3, computer science, Cultural Heritage, Cultural Heritage Diagnostics, cyberarchaeology, Digital, digital archaeology, engineering, museum ethics, museum rules, Open Access, photogrammetry, photograohy, structure from motion, technology, University of California San Diego, Vid Petrovic, visualizationBookmark the permalink. Very interesting (lucky you ;). 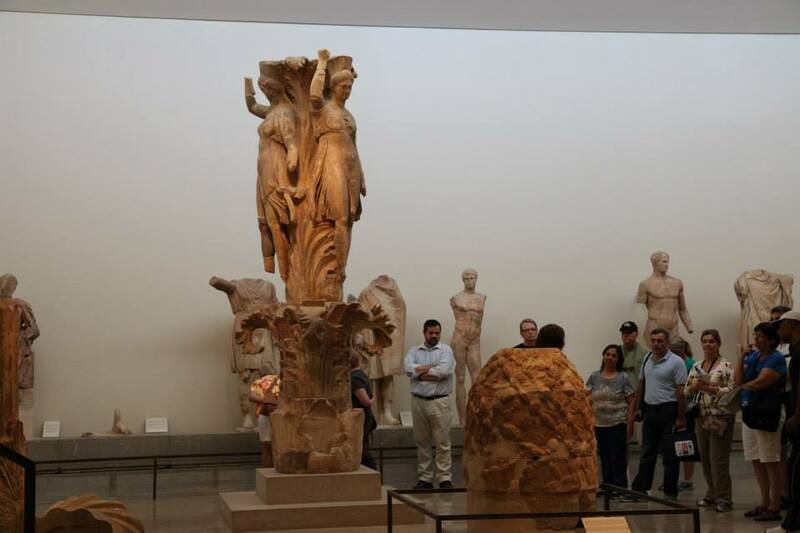 Just out of curiosity, when you visited the Delphi museum, have you heard about the previous scanning project of the Dancer’s column and the Omphalos conducted by Jean-Luc Martinez of the Louvre museum? (http://www.insightdigital.org/entry/index.php?option=com_content&view=article&id=146&catid=45&Itemid=438). It was done in 2005 or 2006 if I remember well (but the point clouds were already impressive – both for size and beauty). At this time I discovered all the limitations regarding the distribution of this kind of data due to copyright and ownership issues as you mentioned in your post… And since then I drop a tear each time I see beautiful renderings of point clouds, just imagining the corresponding data set encrypted in a proprietary file format and forgotten on a rusty hard drive in a few years. Even the great CyArk project is a little bit too “one way” (but I guess they have the same limitations regarding the distribution of data). Maybe there will be one day a new branch of digital archaeology dealing with the (re)discovery and recovery of all those forgotten datasets? I very very much hope so. The Open Access Antiquarianism project I’ve been fussing at is aimed at striking up exactly that kind of dialogue. Its so upsetting that the majority of digital heritage gets locked up–and when it is released its done so in such terrifyingly low resolution that little can really be done with it. One of the goals of my main computer science collaborator is improving the resolution pipeline so that data can be published in the kind of viewers 3D archives like to use while retaining its quality (oh the joys of point buffering).